Former Arsenal and France striker , Thierry Henry has announced his retirement from professional football with immediate effect at age 37. The New York Red Bulls player said he has decided to quit football but will work as pundit for Sky Sports. The 1998 worldcup champion has this to say according to a statement on his official website. "After 20 years in the game I have decided to retire from professional football. 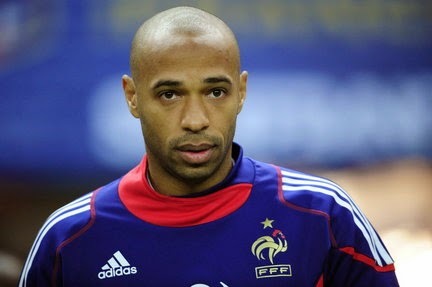 It has been an incredible journey and I would like to thank all the fans, team mates and individuals involved with Monaco, Juventus, Arsenal, Barcelona, New York Red Bulls and of course the French National Team that have made my time in the game so special,"
Henry started his professional career with Monaco and also briefly wore the Juventus jersey before signing for Arsenal in August 1999. The attacker quickly became a key figure at the Premier League outfit, scoring over 200 goals for Arsenal, winning two Premier League titles and three FA Cups during his time in London. He then moved to Barcelona where he was part of the team that won La Liga, Copa del Rey, Champions League, Club World Cup, Spanish Supercup and European Supercup in 2009. Henry spent the last five seasons of his career at MLS outfit New York Red Bulls, while also briefly returning to Arsenal in 2011-12. Furthermore, the forward scored 51 goals in 123 games for France, winning the World Cup in 1998 and the European Championship in 2000.